All about the Lower Snake Dams follows or skip down to re-imagining the future. Between 1961 and 1975 the lower Snake River in eastern Washington state underwent a dramatic transformation when four dams were erected by the Army Corps of Engineers to create an inland seaport at Lewiston, Idaho. That transformation has proved costly for riverside communities and taxpayers who continue to subsidize the dams’ existence. Since that time the dams have obstructed 140 miles of free flowing river between Lewiston, Idaho and Pasco, Washington, and have impeded the migration of salmon and steelhead, killing many millions each year, and landing all runs that weren’t wiped out, on the endangered species list. Power produced by the dams and transportation benefits they provide pale in comparison with the billions spent by rate payers and taxpayers to maintain a broken status quo. The rapidly rising costs of maintaining the lower Snake River system are presenting significant challenges to the federal agencies that manage the dams. 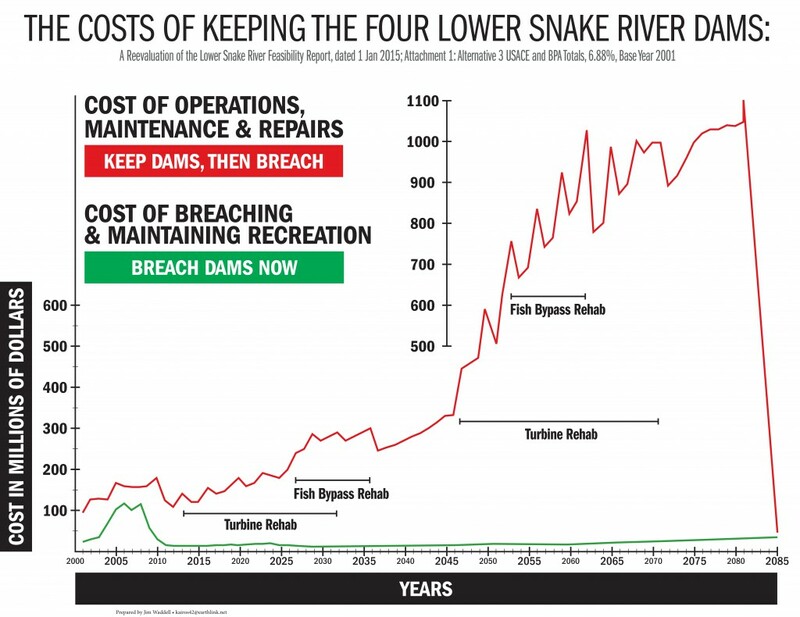 The cost of mitigation hatcheries for lost Snake River stocks is rising a rate of 5 percent annually, and turbine rehabilitation over the next 15 years will require at least $775 million in today’s dollars. A growing set of cost indicators suggest the government can’t continue propping up the system. The 2009 Washington State Marine Forecast projects the growth of freight transportation on the Lower Snake from 2003-2030 to be 0.0 percent. Barging on the lower Snake River from Lewiston through Ice Harbor Dam is in serious decline. Over the past 18 years, freight volume has declined 69 percent, and container shipments from the Port of Lewiston, the only port on the river that ships containers, had dropped at least 82 percent by early April 2015—and 100 percent by late April 2015. The 2009 Washington State Marine Forecast projects the growth of freight transportation on the lower Snake from 2003-2030 to be 0.3 percent. Today even this projection is proving too optimistic. Increased rail fuel efficiency and the growing use of unit trains in Montana, Idaho and Washington have contributed to a shift from truck-barge to truck-rail for the shipment of grain to Pacific Northwest ports. 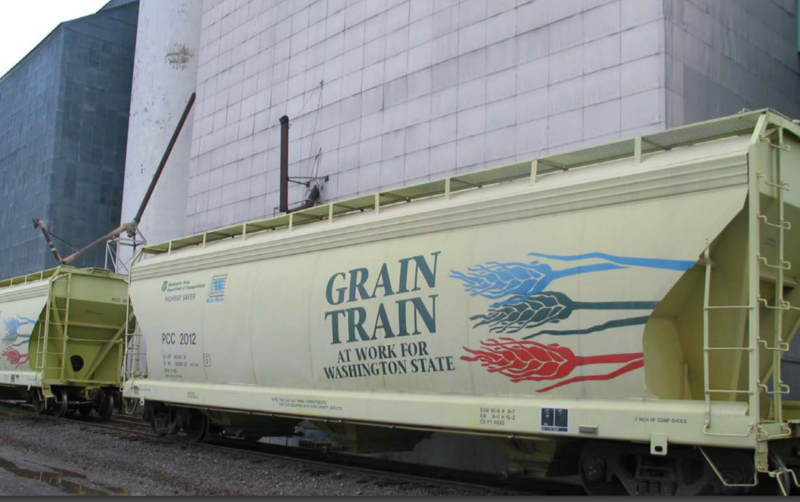 Two unit train grain terminals have come on line in eastern Washington in the last 11 years, and a third is being built west of Spokane and will be fed in part by short lines that penetrate the Palouse Prairie. Washington State is investing in bridge improvements so these short lines can service heavier cars at higher speeds. A 2014 study by the Lewis Clark Valley Metropolitan Planning Organization cited rail improvements and construction of a unit train loader at the Port of Lewiston as the number one priority for improved transportation in the Lewiston area. Containers shipped to ports on the lower Snake River are measured in TEUs, which means Twenty Foot Equivalent Units, a standard global measure for sea freight. What it means is that every 20 linear feet worth of loaded containers counts as a single TEU. 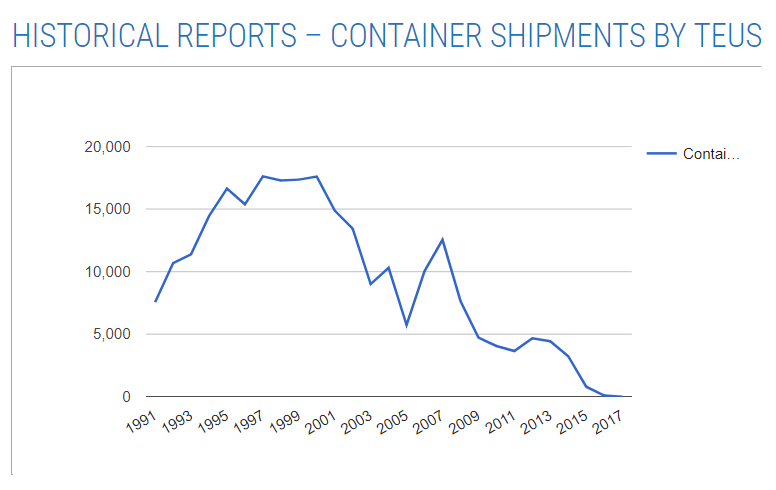 The Port of Lewiston’s container shipments peaked in 1997 with 17,611 TEUs and have been on a long, steady slide ever since. In fact, the Port suspended 100 percent of its container traffic indefinitely in April 2015. Data source: Port of Lewiston (portoflewiston.com). For more graphs, click on the below headline. Ice Harbor Dam is lowermost of the four lower Snake River dams and therefore offers the best indication of the entire waterway’s economic viability. 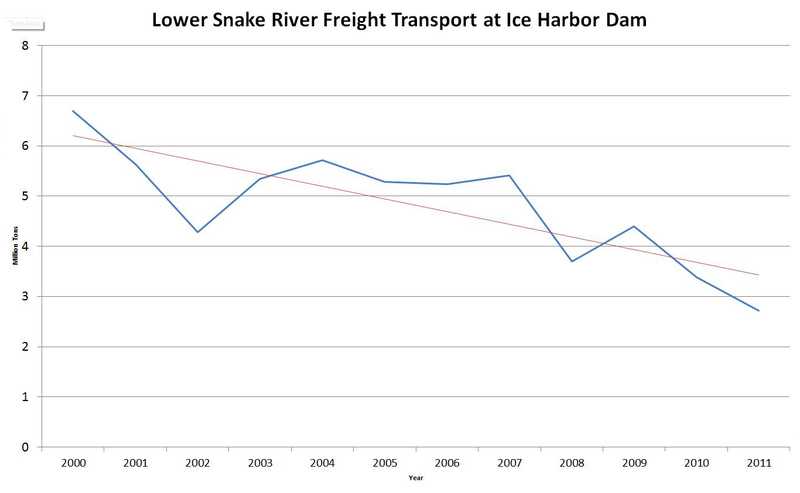 Shipping statistics from Ice Harbor indicate water-born commerce peaked on the lower Snake in 1995 and has been on a long, steady decline ever since. Data source: Walla Walla District of the U.S. Army Corps of Engineers (nww.usace.army.mil). For more graphs, click on the above headline. In 1995 freight transportation on the lower Snake River peaked at 9.16 million tons. By 2000 that volume had dropped to 4.52 million tons, and in 2014 the lower Snake waterway transported only 2.8 million tons. Over the past 20 years the volume of freight transported on the lower Snake River has declined by 69 percent. The U.S. Army Corps of Engineers uses ton-miles to represent the value of a waterway for commercial navigation. A high use waterway produces 300-500 billion ton-miles each year. Any waterway under 0.5 billion ton-miles is considered a waterway of negligible use. The lower Snake River logs 0.3 billion ton-miles annually. If the river’s 2014 freight volume were to more than double, ton-miles would increase to 0.4, and the waterway would still remain in the negligible use category. Since 2000, container-on-barge traffic on the lower Snake River has declined by 82 percent, with more than half of that decline occurring prior to the great recession, which commenced in fall 2008. Major regional industries have abandoned barge shipping. For example, Clearwater Paper, Lewiston Idaho’s largest employer, is located 2 miles from the Port of Lewiston and exports paper and paperboard. Clearwater Paper now ships 95 to 100 percent of its product by truck and rail. With several large sawmills in the region, the Port of Lewiston has not shipped any lumber for at least seven years. Beginning with the 2002 Lower Snake River Juvenile Salmon Migration Feasibility Report, all projections of future levels of freight volume on the lower Snake River have been vastly overstated. Even the 2009 Washington State Marine Cargo Forecast prediction of 0 percent growth from 2002-2030 has proven to be much too optimistic. The cost of maintaining the lower Snake River waterway is growing rapidly. The Army Corps of Engineers recently acknowledged an annual cost of $7.6-$12.6 million just for operations and maintenance of the waterway. In addition to normal maintenance and operations, and sediment management planning costs, dredging recently cost more than $23 million for the upper part of the Lower Granite pool, with more implementation costs to follow. The Walla Walla District’s claim in its 2014 Lower Snake River sediment management plan that the lower Snake River waterway provides cost savings of $8.45 per ton is false. The Walla Walla District derived this figure from the 2002 Lower Snake River Juvenile Salmon Migration Feasibility Report, which claimed a savings of $5.75 per ton, a figure based on an earlier study of shipping volumes on the deep draft section of the Columbia River downstream from Portland. The 2002 economic analysis of transportation on the lower Snake violated Corps guidance regarding the use of rates rather than costs and was based on a highly overstated projection of future freight volumes. The transportation economics part of the 2002 study was so flawed the Walla Walla District itself stated the results should not be used again without further refinement. The current use of this savings figure by ports and special interest organizations is unsubstantiated propaganda. You can read more about it here. A reanalysis of the 2002 Lower Snake River Juvenile Salmon Migration Feasibility Report demonstrates the Army Corps’ Walla Walla District underestimated the average annual cost of keeping the lower Snake River dams in place by a staggering $160.7 million. The lower Snake River project is economically unjustifiable and fiscally unsustainable. In addition to direct taxpayer costs, the many benefits lost from maintaining this project—from vastly improved sports and commercial fisheries to alternate investment in a transportation system that can benefit a much wider range of businesses — make the early removal of the four lower Snake River dams imperative. There are an estimated 37,000 acres of industrial farmland irrigated by the reservoir behind one dam, Ice Harbor. Congress did not authorize flood control as a purpose and the dams were not designed for it. They are “run of the river” dams, meaning they were not built to store water. Due to sediment build up, Lower Granite Dam actually creates a flood risk to Lewiston, Idaho. With the support of elected officials, the Corps has the authority and the time to update the 2002 EIS now and still act this year. The dams are aging, and escalating costs of necessary maintenance—paid for with tax and rate payer dollars—are stressing already-tight federal agency budgets. Freight transportation has declined drastically as the combination of trucks and railways have become more efficient than trucks and barging. The dams produce hydro-power at a fraction of their capacity, and affordable replacement options are already in place, or readily available. The dams do not provide flood protection or any meaningful amount of irrigation. Economic benefits of the dams are far below the costs (benefit to cost ratio of .15, meaning 15 cents in benefits to every tax dollar spent). Costs for operation and repairs currently exceed power revenues and economic benefits derived from navigation and irrigation. Corrected Cost and Economic conclusions based on Corps data and planning processes show breaching via channel bypass has benefits ranging from 4 to 20 to 1 with Regional effects adding more than 5K jobs in E. Washington and Lewiston. Irrigation pumps could be replaced and pipes extended to the Snake River for farmland irrigated behind Ice Harbor Dam. Or, the land could be converted to non-irrigated farmland or pasture. Either option would cost far less than maintaining the salmon-killing dams. We now have excellent examples of indisputably successful dam removal and river restoration projects: the Elwha and Glines Canyon dams on the Elwha River of Washington state, Condit Dam on the White Salmon of Washington state, four dams on the Penobscot River in Maine and Marmot Dam on the Sandy River in Oregon. The widely-celebrated removals of these large dams has reduced taxpayer waste and restored fisheries, injecting additional dollars into rural economies.